I really don't know where to begin. It has taken me a couple of days since returning home from France to get caught up. I am not sure it has all sunk in yet. I had the most amazing and magical two weeks in Provence and I think I left a part of me there. I came home filled with memories and inspiration.....and goodies. I have a duffle bag full of interesting finds from my trip. I also have 40 paintings done on my trip and over 3000 photos! That's a lot of inspiration and I will begin to sort them and find a way to share them here with you. As for my past summer trips I will be writing a detailed trip report and sharing some of my photos and paintings. 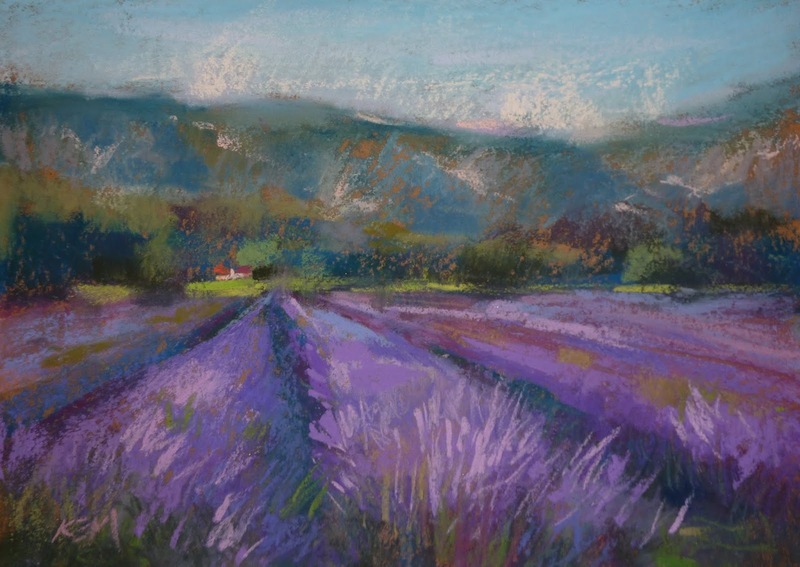 I hope you will follow along and enjoy the virtual trip to Provence. Many of these paintings are now available in my Etsy shop. They are $95 each with free shipping. Click here to see them all. My pastel set up was perfect for this trip. It wasn't a painting trip. In fact only one other travel mate was an artist. I wasn't sure how much time I would have to paint and I was determined to travel light. 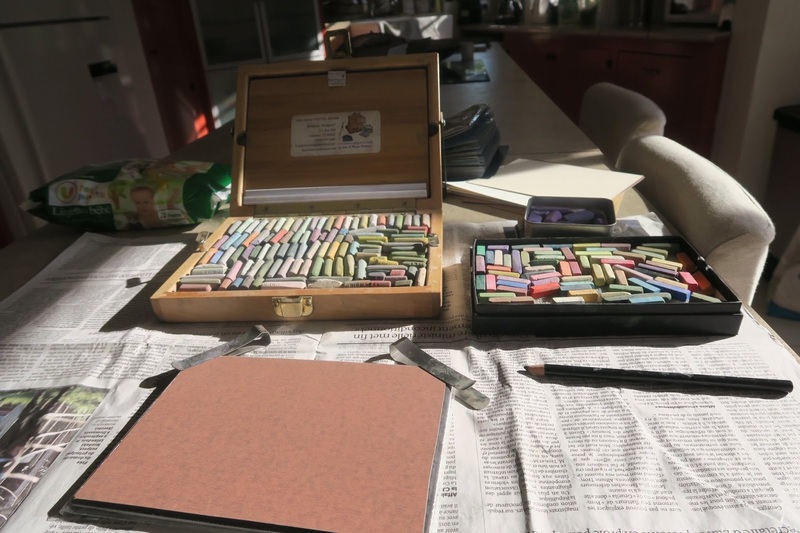 I didn't want to be bogged down with a big box of pastels and an easel. Here is what I used. It all fit into a zippered book cover and that fit easily in my backpack. Heilman single sketchbox was the perfect size. 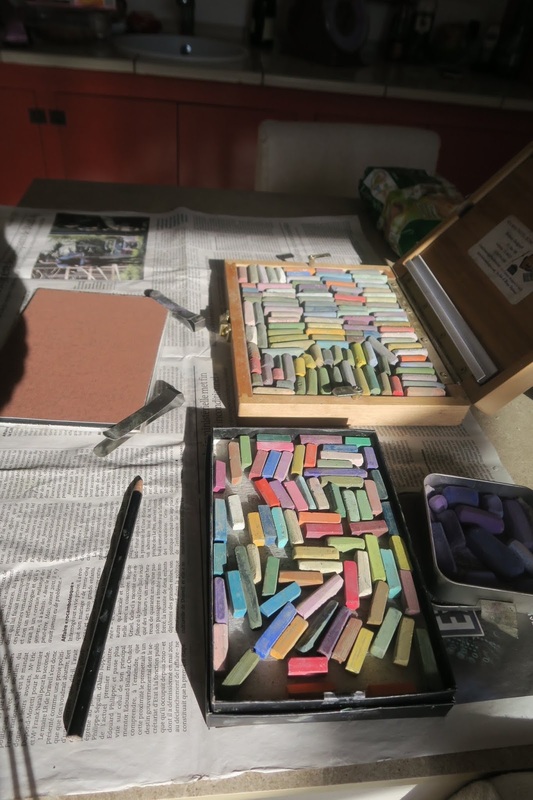 It has one section for pastels and can be used as a pochade box. To get the maximum use of the space I used Girault pastels that I broke in half. (I had the two Richard McKinley sets and fit most of them in the box. Girault pastel are wonderful because they are firm yet go on soft....they are great for travel. To supplement the Giraults I filled a small Nupastel box with some broken pieces of Nupastels, I chose them because the harder Nupastels work great with the softer Giraults and they also travel well. The small thin box fir into the pocket of my book cover. My Purple box! If you look closely at the photo you can see a small tin box. It has a selection of Terry Ludwig violets. 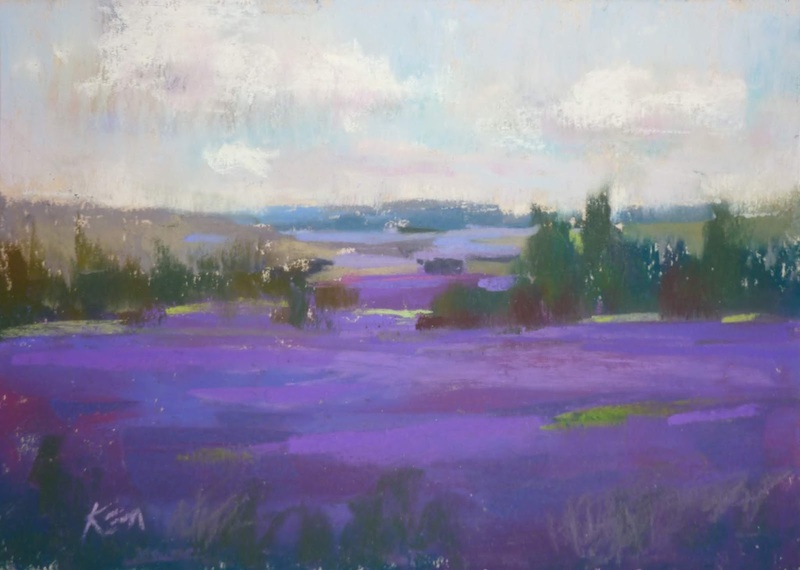 I knew I would be painting lavender and I would need some good purples. I am so glad I brought this small selection of violet pastels. Paper and Itoya portfolio to hold paper and finished paintings. I precut 45 pieces of pastel paper in 5x7 size. I used an assortment of paper including Pastelmat, Uart, Wallis warm mist and some homemade surfaces with clear gesso. I filled a 5x7 Itoya portfolio book with the papers and as I finished a painting I would slip it back inside the book. This kept my papers and paintings safe and clean. A piece of 5x7 foamcore covered with a clearable plastic bag for protection. This was my painting board. I used small Banker's clasps to hold the paper in place. NO easel. I worked flat either on my lap or at a table or countertop. Since I was working small It worked well without an easel. It was liberating! Another look at my set up. After a painting session I just recycled the used newspaper. I got into a good painting routine and usually managed to paint 4 painting each day. 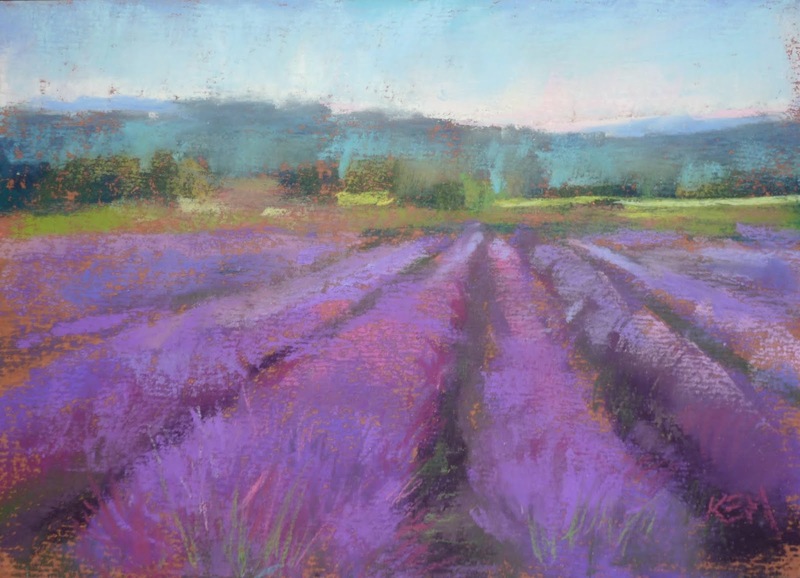 I am looking forward to interpreting these paintings and using the photos I took to paint larger studio paintings but there is something very special about the paintings I did while in Provence. I'd like to think they are infused with the magic I was feeling.